Poached eggs over corn masa cakes with Canadian bacon and hollandaise. Gluten free. Sunny-side up eggs over a crisp tortilla and refried black beans. Topped with, roasted tomato-chipotle sauce, salsa,verde, ham, peas and cheese. Gluten free. Caramelized onion, chorizo and potato with melted Chihuahua cheese and scrambled eggs layered on tostadas with mestiza crema and pico de gallo. Gluten free. Scrambled eggs a la plancha, rajas, bacon and queso chihuahua. Finished with chile de arbol salsa, onion and cilantro. Gluten free. Seared ham steak topped with scrambled eggs, corn tortillas and a creamy, smoky chile sauce. Mexican donut crusted French toast topped with fresh berries and served with piloncillo syrup. Vegetarian. A classic Caesar with crisp romaine lettuce, grilled ancho-marinated chicken breast, roasted red peppers and chile croutons, tossed in a classic Caesar dressing. Chicken, chorizo sausage, avocado, tomatoes, crispy tortilla strips and habanero pickled onions over mixed greens, tossed in a creamy avocado dressing. Gluten free. Grilled salmon with Tuscan kale, roasted corn, chayote, tortilla strips and roasted poblano peppers tossed in a serrano pepper vinaigrette. Gluten free. Roasted chicken tinga with creamy tomatillo sauce, cilantro, onion and melted chihuahua cheese. Gluten Free. Chipotle braised beef with mestiza sauce, crema, cilantro, onion and queso fresco. Gluten free. Chicken tinga covered with traditional mole poblano and topped with cilantro, onion, queso fresco and crema. 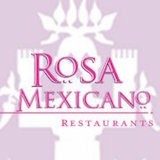 A taste of Rosa Mexicano’s signature enchiladas mole poblano, suiza and mestiza. We have been preparing freshly made guacamole with avocado, jalapeno, tomato, onion and cilantro. Served with warm tortilla chips and salsa. Vegetarian. Gluten free. Melted chihuahua cheese over poblano rajas. Topped with cilantro and served with handmade corn tortillas. Vegetarian. Gluten free. Crispy tortillas topped with black beans, queso fresco, white cheddar, menonita cheese, pico de gallo, chipotle and serrano chiles. Vegetarian. Gluten free. Mexican white shrimp from the baja coast marinated in citrus with jicama, avocado, roasted habanero, red onion and cilantro. Gluten free. Corn masa empanadas stuffed with shredded chicken, Mexican chorizo and Menonita cheese. Served with mestiza crema. Crispy corn tortillas filled with chicken tinga and topped with salsa pasilla de Oaxaca, salsa verde, queso fresco and crema. Roasted tomato-pasilla chile broth with grilled chicken, avocado, chihuahua cheese, crema fresca and crispy tortilla strips. Gluten free. Crisp romaine lettuce, roasted red peppers and chile croutons tossed in a classic Caesar dressing. Vegetarian. Adobo-marinated grilled chicken breast and chihuahua cheese with pico de gallo. Grilled flour tortilla filled with braised beef tinga and Menonita cheese. Topped with red onion, crema and salsa verde. Guajillo chile-tequila marinated grilled steak and Menonita cheese with pico de gallo. Baja shrimp sauteed with ancho chile, garlic and lime on flour tortillas with a blend of Mexican cheeses. Chicken breast a la plancha, rajas, bacon and queso Chihuahua with chile de arbol salsa, onion and cilantro. Gluten free. Braised beef brisket with tomatillo-habanero salsa, house-made slaw and pickled red onion. Gluten free. Maseca cornmeal-dusted shrimp with kale, chipotle aioli and pickled onion. Beer battered seasonal fish with white cabbage escabeche and jalapeno-tartar sauce on a fresh flour tortilla. Grilled portobello mushrooms, black bean, roasted red and yellow peppers, grilled corn, cabbage and chile de arbol salsa. Vegetarian and gluten free. Roasted poblano chile filled with goat cheese, rice, sauteed mushrooms and grilled chayote. Served with piloncillo tomatoes, salsa verde and queso fresco. Vegetarian. Slow-braised pork with cilantro, white onion and grilled pineapple. Served in a cast iron skillet with handmade corn tortillas. Gluten free. Braised chicken tinga layered with soft corn tortillas, Chihuahua cheese, roasted Mexican peppers and grilled corn over poblano cream sauce. Gluten free. Grilled wild jumbo shrimp marinated in garlic vinaigrette with tomatoes, onions and serrano chiles, over achiote rice with salsa verde picante. Gluten free. Grilled fresh salmon served over sauteed Tuscan kale, chorizo and corn in a poblano cream sauce. Gluten free. Grilled skirt steak marinated in guajillo chile and tequila with rajas con crema, guacamole and a Chihuahua cheese enchilada topped with a roasted chipotle-tomato sauce. Gluten free. Braised chile ancho-marinated pork shank served with salsa verde, white cabbage escabeche, pickled red onion and fresh corn tortillas. Crispy chicken breast filled with huitlacoche, served sliced over poblano cream sauce. Ancho marinated chicken breast with slow-cooked peppers and Chihuahua cheese. Gluten free. Achiote-roasted cauliflower, rajas, kale and corn. Vegetarian gluten free. Guajillo chile and tequila marinated steak with chile rajas and Menonita cheese. Gluten free. Mexican corn on the cob. Vegetarian and gluten free. Cauliflower with achiote. Vegetarian. Gluten free. Kale, corn and poblano. Vegetarian. Gluten free. Beef brisket, tomatillo salsa, slaw and pickled red onion. Gluten free. Beer battered seasonal fish, white cabbage escabeche and jalapeno tartar sauce. Grilled portobello mushrooms, black bean, roasted peppers, grilled corn and cabbage. Vegetarian . Gluten free. Slow-braised pork, cilantro, white onion and grilled pineapple. Gluten free. Braised beef tinga and Menonita cheese. Mexican peppers and Menonita cheese. Crispy corn tortilla, chicken tinga, salsa pasilla de Oaxaca, salsa verde, queso fresco and crema. Corn masa empanadas, shredded chicken, Mexican chorizo, Menonita cheese and mestiza crema. Chipotle-braised beef with mestiza sauce, crema, cilantro, onion and queso fresco. Gluten free. A taste of Rosa Mexicano’s signature enchiladas - mole poblano, Suiza and Mestiza. Grilled flour tortilla filled with roasted peppers and Chihuahua cheese. Topped with crema. Vegetarian. Baja shrimp sauteed with ancho chile, garlic and lime. Served with a blend of Mexican cheeses. Roasted tomato-pasilla chile broth with grilled chicken, sliced avocado, shredded Chihuahua cheese, crema fresca and crispy tortilla strips. Gluten free. Grilled portobello mushrooms, black bean, roasted red and yellow peppers, grilled corn, cabbage and chile de arbol salsa. Vegetarian. Gluten free. Pan-seared fresh fish with grilled spring vegetables and tomato gazpacho. Topped with sautéed shrimp and mushrooms. Gluten free. Skewered and grilled filet mignon, chorizo sausage, onions, tomatoes, and serrano peppers. Served over house rice with tomatillo and tomato-chipotle sauces. Gluten free. Braised chile ancho-marinated pork shank with salsa verde, white cabbage escabeche, pickled red onion and fresh corn tortillas. Ancho-marinated chicken breast with slow-cooked peppers and Chihuahua cheese. Gluten free. Achiote-roasted cauliflower, rajas, kale and corn. Gluten free. Choice of entree, ice cream and beverage.Served with Mexican rice, black beans and fresh roasted corn or green salad. Please contact to the merchant for choice of soda and juice. Fair trade Mexican coffee from chiapas, avion reposado, ancho reyes chile, liqueur, 1921 crema, Aztec chocolate, bitters, kahlua cream. Classic three milk cake topped with toasted coconut flakes and fresh berry compote. Hot Mexican doughnuts dusted with sugar and cinnamon. Served with dark chocolate and raspberry-guajillo dipping sauces. Vanilla custard with caramel sauce. Mexican chocolate cake with Kahlua whipped cream and raspberry-guajillo sauce.